A three-year-old is safe at home tonight after getting stuck in an 8-inch pool filter near a jacuzzi at the Rio Vista Apartments in San Ysidro. 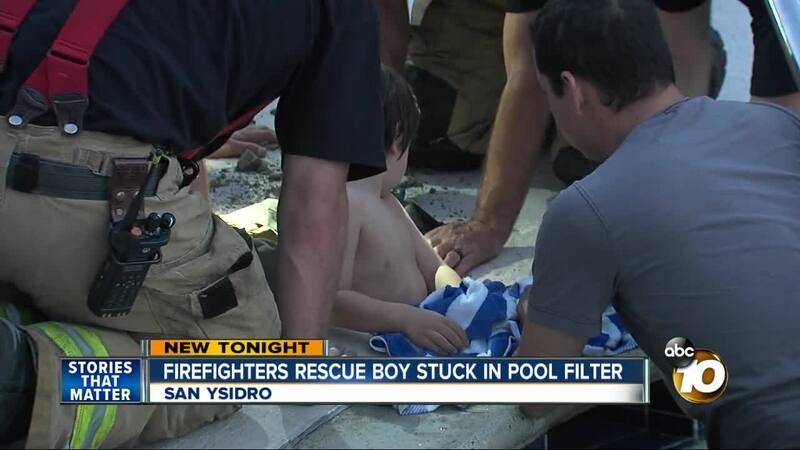 SAN DIEGO (KGTV) - A 3-year-old boy was rescued Monday after he became stuck in an 8-inch pool filter near a hot tub at a San Diego apartment complex. The San Diego Fire and Rescue Department received a call at around 6:30 p.m. regarding the incident at the Rio Vista Apartments. Responding fire crews arrived to find the boy in a kneeling position and stuck inside in the filter. Crews used a hammer to chip away at the cement surrounding the filter, and then broke the plastic on the filter to get the little boy out. During the rescue, the toddler could be heard screaming and crying, but he eventually calmed down and was seen playing with his dad and waving at the cameras. SDFRD Capt. Bill Waugaman said the rescue was initially stressful because of the boy’s tears, but once the child relaxed, firefighters were able to take their time to get him out without hurting him. After about an hour, firefighters pulled the boy out, unharmed. It was not immediately known how the boy became stuck in the filter.